Every cell in the body needs protein; it’s required for growth and repair, enzyme and hormone production and plays a key role in creating antibodies which fight off infection as part of the immune system. Generally, around 15-20% of our calorie intake should come from protein. So what should we be eating? Clinical Nutritionist, Suzie Sawyer, shares her tips for including protein at every meal time! In many ways, breakfast is actually the most important meal of the day. It is a key opportunity for the body to be refuelled with essential nutrients. Eating breakfast is vital because blood sugar levels are low after a night’s sleep and the body needs feeding in order to provide sustained energy for the day. 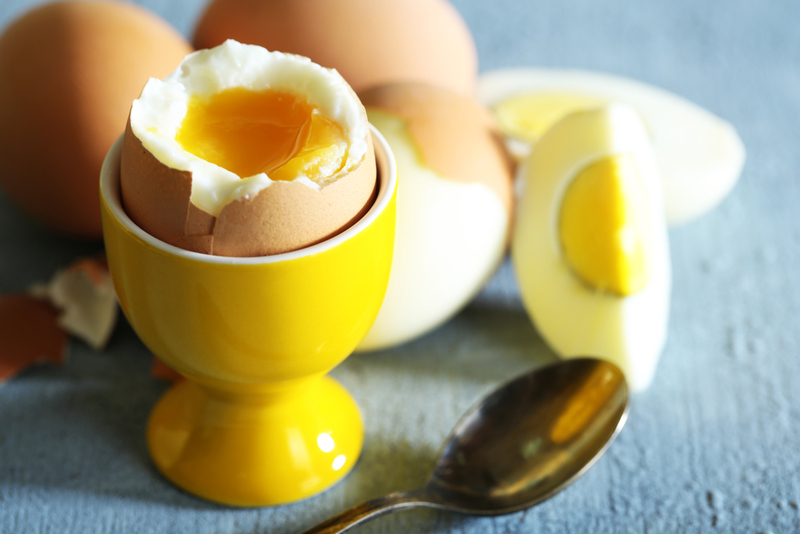 Top of the list for best breakfast choice would be eggs; they’re a complete protein source, meaning they contain all the essential amino acids the body needs and which it cannot make. The main reason we need protein in our diet is to supply the eight essential amino acids and eggs provide these. If eggs are not for you, how about a designer muesli instead? If you mix up some oats, barley flakes, rye flakes, wheat germ, seeds and add some chopped apricots and raisins, you’ve got a tasty and nutritious breakfast. All these grains all contain protein. This muesli can be mixed up and stored for a while; a portion can also be soaked overnight in milk or apple juice, making it easier to digest in the morning. Even better, all the grains are slow energy-releasing, which means they’ll keep you going through the day plus they’re also packed with energising B vitamins. Lunch often has to be prepared quickly or transported to the office or place of work. But this shouldn’t stop you from including a choice of protein and colourful foods. 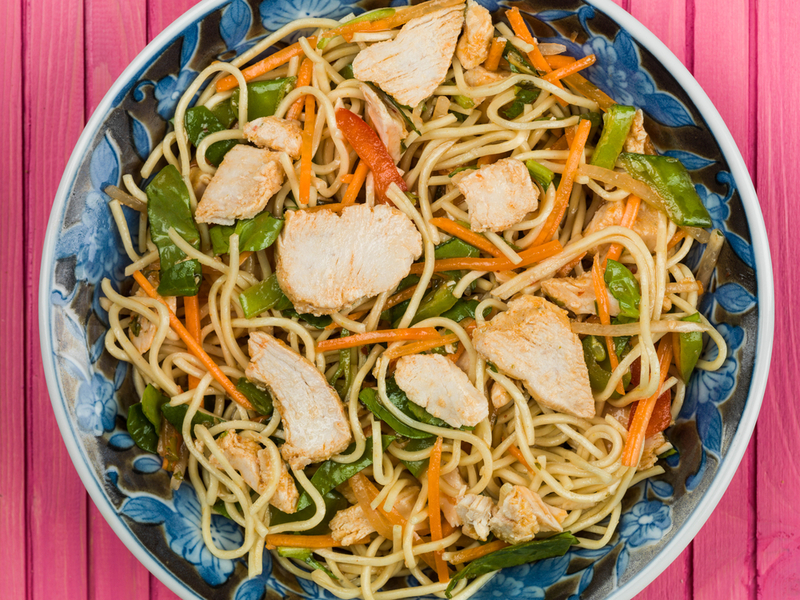 Chicken noodle salad is a good example of something that can be made in advance with cooked chicken breast or left-over chicken, rice noodles, baby corn, sliced carrot, soy sauce, garlic and shredded cabbage or spinach leaves. However, if you’re vegetarian you can swap the chicken for tofu or prawns and you’ve got a really quick, nourishing salad. The protein (chicken, prawns or tofu) can either be eaten hot or cold. Another high protein and energising carbohydrate lunch can be found in a spicy bean salad. Beans are low on the glycaemic index but also contain good amounts of protein. Tinned mixed beans can be combined with tomato, cooked French beans, coriander and Tabasco sauce along with your favourite dressing. Easy, quick, delicious and sustaining! Protein is found in so many different foods, which means there’s a wealth of dishes on offer for dinner. Animal protein includes red meat, chicken, turkey, fish, dairy products, and eggs. Animal proteins generally contain all the amino acids whereas plant-based proteins don’t. However, by carefully combining grains with beans, for example, you can get all the essential acids you need. 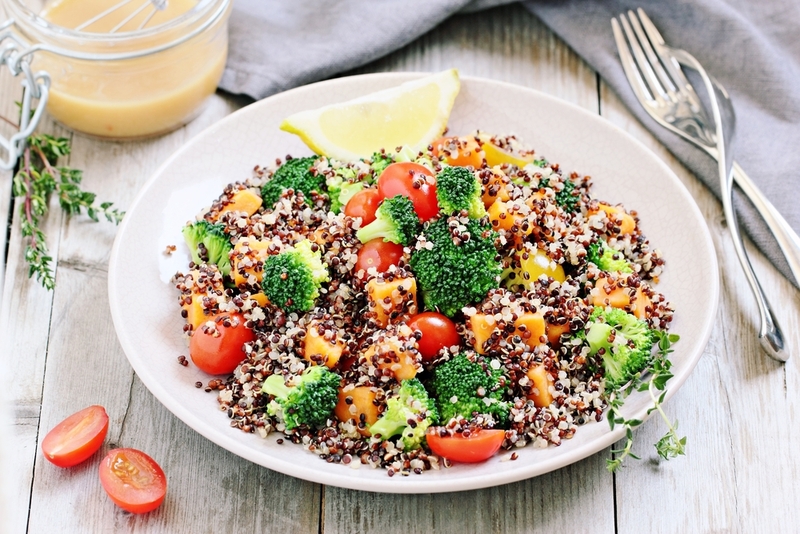 Quinoa, which has a very similar texture to couscous, has a really good amino acid profile, making it a great protein source whether you’re vegetarian or not. Quinoa works really well as an easy dinner dish with roasted vegetables. If you’ve had eggs for breakfast, chicken for lunch, then how about some protein-packed fish for dinner? 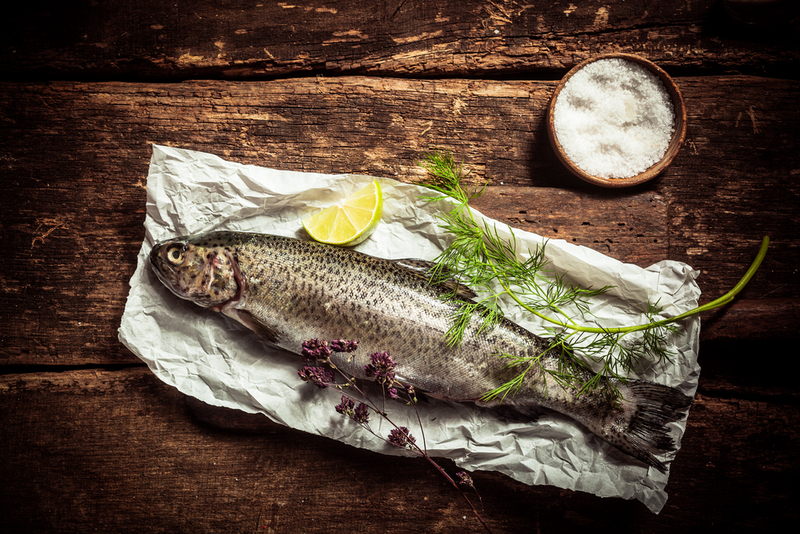 Oily fish such as trout is absolutely delicious and is also packed with omega-3 fats which are great for the brain, skin and heart. Any oily fish can be really simply cooked in a baking dish, drizzled with lemon and olive oil and served with some lightly toasted pine nuts and steamed vegetables. Another excellent source of protein are lentils. They’re also packed with fibre to keep the bowels super-healthy. Lentils work really well with spinach; whilst you’re cooking some brown lentils, chop some coriander, cumin and garlic. These can be briefly stir-fried before adding to the pan with some spinach. All the flavours combine really well together and you’ll be getting some energising iron from the spinach as well as some heart-loving garlic. With so many protein options available, your body can be properly fuelled and nourished all day long.